Until a few years ago Impatiens were seen as a little old fashioned, the most common form was it commonly called ‘Busy Lizzie’. Times change, and these colorful, easy care plants are now back in fashion. New varieties, some that are more disease resistant, are on the market and the older types are also making a big comeback. With masses of attractive flowers, Impatiens plants and species are again a popular plant for hanging baskets and containers, they love dappled shade and make an excellent plant for a patio. Impatiens are a tender perennial that requires a shady position to do its best. They are often grown in pots or baskets and are popular for the flowers which seem to last forever. Keep plants well watered, they do not like to dry out. Choose a position in light shade or morning sun, afternoon shade. A humus rich moist and well drained soil is essential. Dig in some compost and well rotted cow or sheep manure a few weeks before planting. In the garden plant them at around 8 inches (20cm)apart, unless you want them to grow taller, when 4 inches (10cm) will be great. Water well, especially during hot weather or dry periods in summer. Flowering period is long, from spring right through until the end of summer, longer in warmer climates. This is a relatively new disease, and is often first spotted as the leaves begin to yellow a little, this is followed by a white powdery growth usually on the underside of the foliage. 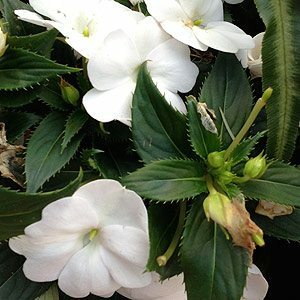 This is a fungal disease and although it can be treated plants are often best destroyed.The New Guinea Impatiens have good resistance to Downey Mildew. I. walleriana is widely used. Also known as ‘Busy Lizzie’ it flowers almost year round in warmer climates. I. glandulifera or ‘Himalayan Balsam’ is more unusual. Also known as the ‘Policeman’s Helmet’ it does tend to spread a little to easily for our liking. I. niamniamensis is rare in Australia. It is a tropical species, very colorful with red and yellow flowers. Impatiens x hawkeri or New Guinea Impatiens is used widely for hybridising and is becoming more popular as new varieties are released.